Seems like I've been hitting a lot of local Cincinnati beers lately, haven't I? 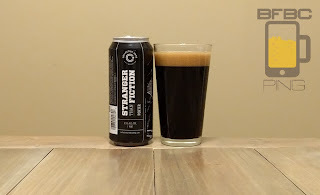 Well, with relatives in the area, why not take advantage of the access to see if other cities have just as vibrant of a local microbrewery scene as the greater Nashville area has proven to have? The slightly hazy amber beer has a white head that is patchy and sticky enough to be an IPA rather than a straight pale ale. The aroma backs that up with the scent of pine and tropical hops absolutely exploding from the top of the beverage as soon as I pour the sucker. This is going to be a stronger pale ale than the rather bland can would lead me to believe. 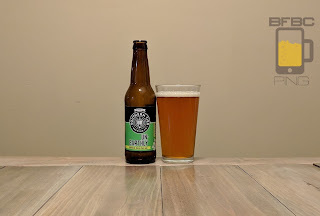 First sip is a strong flavor of various citrus hops and tropical fruits - but it's got a lot of rind in it to alter the taste pretty dramatically. The biscuit malt has a nice and crackery crust, but it's not holding back the bitterness that much. There's a lot to unpack here, and the sip is just not the way to do it. I remember the first time I heard that Lamborghini put an Alpine radio in their cars. That was it. Alpine must be the best radio. Later, I had a car with an Alpine radio in it, and I realized that most Lamborghini Countach owners were probably either listening to the engine or so high on cocaine they didn't care about radios. To be fair, this is a wholly different company. The murky gold beer has chunks of detritus floating like a fog inside - and I dig it. The white, frothy top is sticky and leaves an okay amount of lacing. The aroma is tangerine, orange, and grapefruit hops, and I am loving everything so far. I may just be really thirsty, but that is benefiting the beer right now. First sip is a bitterness from those fruity hops that is not properly tamed by the malt that tastes like a cracker that has been sitting out way too long and something is growing on it (probably coming from the yeast, really) that is kind of off-putting in a way that I was not ready for. To level set, I originally wrote this review at the tail end of 2017, so it was the dead of winter when I wrote it. This is, then , completely appropriate for the time of year that I was drinking it. 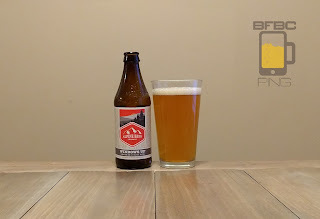 I just have a massive backlog of beers that I reviewed and didn't bother to publish until now. I'll try to do better in the future. 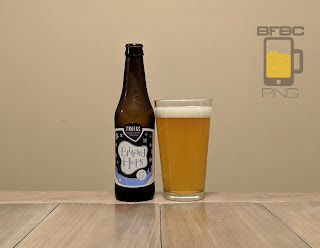 The pale yellow beer has only the slightest bit of mistiness inside of her and the white cap is patchy and sticky - just like the best IPAs have. Given the very light color of the beer, I anticipate this drink with a bit of trepidation. The aroma is a bit weaker than I would have liked, but it's definitely lemony. First sip is watery on the front end and acidic on the back end. 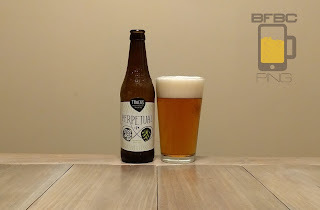 It's not terrible for a lemony drink, but it is definitely not a sipping IPA; it's just too much like an unbalanced see-saw with the front and end fighting each other, and the middle not bringing very much. Don't confuse this (as I did briefly) with the 2XMAS seasonal beer that I looked at a while back. 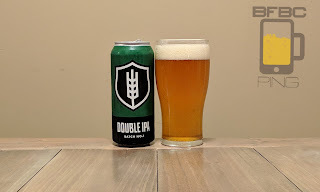 Instead, this is a double IPA, a style that is my newest favorite beer style, and I don't expect it to be knocked off the top of the hill any time soon. That said, I hope to encounter more styles and more beers to find the ever-so-elusive 5.0 beers. The very golden yellow beer has less head than I expected, but it's a sticky enough head to warrant consideration. The splotchy patches that wind up on top of the beer are reminiscent of a fractal or something similar. The aroma is sweet, dusty citrus and pine. That citrus is mostly grapefruit, if I am any judge - and judging beer is literally why this blog exists. What? Is this not an IPA? 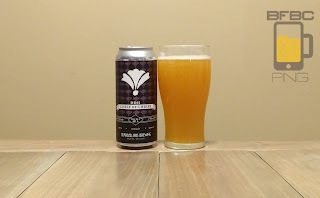 But... most of the Bearded Iris beers that I've had have been derivations of IPAs, and they have been interesting and made me want more. But this is an Oktoberfest. I can't blame them for wanting to try one of these out, and they can't blame me for trying it and telling you, my loyal reader, what I think about it. The honey golden beer has a very patchy head that bubbles away to leave a little bit of lacing on the sides and wisps on top of the beer that look downright artistic. The aroma is flowers and honey. It's an odd combo for an Oktoberfest, in my opinion, but I'm not going to lie and say that I don't want to try it. In fact, I'm more eager now than I was before. Mill Creek has a history here of being a bit better than average (three beers is a history, right? ), but they haven't had anything that was really a break-out beer. With a DIPA, they have a chance to put together something special. 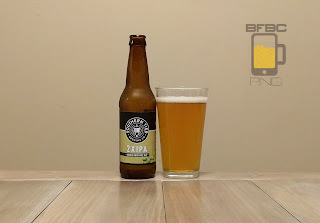 DIPAs somehow manage to smooth out a fierce IPA to bring a lot of flavor and a lot of calm at the same time. This should be good. 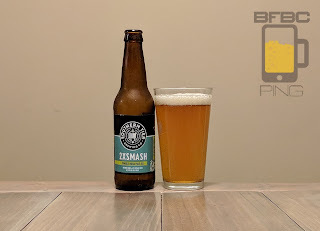 The beer is a light honey color with a nice, sticky white head that takes a while to dissipate, and it leaves the much loved lacing in its wake. It's not a sheet of lacing, but it's scattered bubbles that are defiantly gripping the sides. The aroma is sweet and piney. There are citrus hops under that, but it's breath of an alpine skiing resort. I have avoided sour beers, as I have put them in the category of things that hipsters are really trying to make happen, and I just don't want to befoul my mouth with a concoction like HiCu ever again. 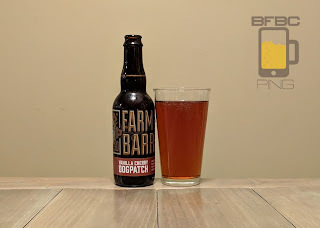 The fact is - I know sours have gained in popularity, and a sizable portion of the good beer section of my favorite beer store is starting to be taken up by them, so I need to give them a chance, right? There's a red cast to the very clear amber beer that has absolutely no damn head at all. It's not flat - the head was like seltzer water with the way it popped up while being poured and then disappeared right back into the liquid. The aroma is stringent with the sour cherries and stems all up in my face with the smell of something that has been aged in oak and mixed with some fermented grapes. 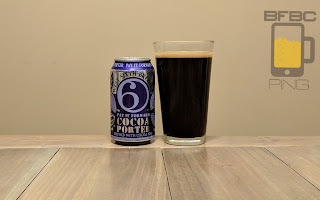 This CBS is not named after The Tiffany Network (Columbia Broadcasting System). Based entirely on the label, I'd say it was based on The Mounties, the Canadian ... err... Bouncing Stallions? I don't care. Jeremy went out of his way to save me a bottle of this and - no matter if I like it or not - I am very grateful for the opportunity to try it. The exceedingly dark brown beer has a head that looks like it's made of some kind of whipped chocolate, and there is a LOT of that head. I swear I poured about as carefully as I could, and I still wound up with head of about 1/4 of this pint glass. The aroma is thick with oak, earth, maple, coffee, and chocolate; it's really rich smelling. Another Nashville Brewery for the blog. At what point does my blog achieve the popularity that the local breweries start to seek me out and give me free beer? I mean, I'm certainly accessible. And goodness knows I want to try more beer and would love to save the money I routinely put down at City Sliquors to buy more. What I'm saying is - call me, Boo. The clear brown beer has a head that is definitely not leaving any lacing. It boils down to a light dusting with the ring around the sides of the glass, but the bubbles just aren't sticky in the least. The aroma is nutty and malty with a touch of brown sugar. First sip is... gripping. It is nutty and all, but it adds quite a bit of bitterness from coffee, earth, and even pine. 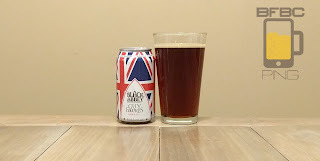 It's brown ale through-and-through, but that doesn't mean it's particularly approachable. Instead, it is packed full of flavor and quite heavy with potential. Let's see what the swig brings. 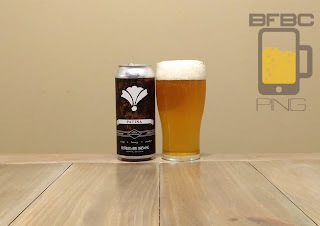 I'm not sure if Bearded Iris will get knocked off of my list of favorite brewers, as they have really worked hard to get there. Yes, Lagunitas has been more consistently high in my ratings, but even their large number of varieties don't match the number that Bearded Iris seems to be coming with. I don't even recall the last new beer that I saw from Lagunitas, and I'm looking. Instead, I get the very good beers from this local brewer. The familiar juice texture and murkiness is joined by a tangerine orange color with a head that just has no staying power. Yes, there's a dusting that lingers quite a bit, but there isn't going to be any lacing, and that's a miss, in my book. 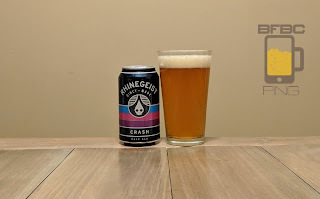 The aroma is very much grapefruit with other citrus tossed in just to make things a bit more interesting, but that grapefruit is right in my face. I'm calling this a hard soda in my labels, but I really don't know what to call it. The only other "apple pie" beverages I've had were moonshines, and a 5.5% ABV moonshine is... not a moonshine. So, as these guys brought me the Not Your Father's Root Beer, I'm assuming they use a similar method for... brewing(?) this beverage. The clear yellow drink has almost no head to start with, and by the time I got to the camera, it lost pretty much any head that it had in the first place. I think a can of Coke would have had a head that lasted longer. 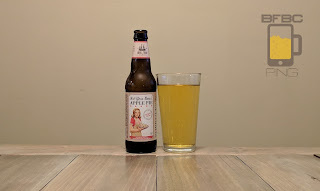 Still, points of nucleation show that this is a carbonated beverage, and the aroma of apples is both sweet and tart to the nose with a bit of cinnamon spice. I'm calling it: this is a cider. When Southern Tier rolls out another IPA, I'll jump in line to try it every time. "But Tim," you may find yourselves saying, "Don't you jump in line for pretty much every new beer you find?" Well, smartypants, I will avoid Prairie Artisan and Magic Hat, but I guess you're right about most of the others. I'm going to call the color an amber haze with a honey hue. The light head is barely there, but this thin head sticks around for a while. The aroma is resin, citrus, pine, and flowers - it seems like they have all the hops going on in here. First sip is quite the taste sensation. The hops are citrus heavy, and they bring the others with. The bitterness is here about as heavy as the resin, and the resin is just behind the hops. The malt is very mild, but it's trying valiantly in its losing battle with the bitterness. When you're looking at microbreweries, you may find that you can't swing a dead cat without hitting one these days. This one is based in Hershey, PA, so it is only fitting that the first one I review has chocolate in it. Is it Hershey's chocolate? Well, they don't say, but I'm going to say probably. I could be wrong. The black beer has more brown than red, which seems strange. With this being a cherry stout, I automatically assumed the normal ruby color of a stout would be even more red with the addition of the cherries. The head is pretty thin, and the bubbles are a mix of very many tiny ones and a few biggies. The aroma is chocolate, coffee, and sour cherries. Sour? I hope not. NIBS! 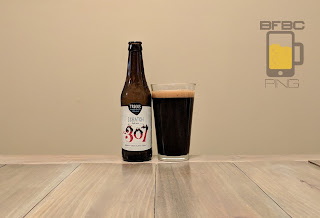 From Lexington Kentucky comes this porter featuring NIBS! Now, I know what you're thinking - what is a nib? Aren't nibs those really good Twizzler-like red licorice things you can get in good candy stores and pretty much any other place that sells candy? Well, yes, but that's a brand name. I don't know which part of the cocoa plant is the nib, but I hope it tastes good in beer. The very dark porter is another one that is ultimately a bit red, but it takes a bit of effort to establish it. The head boils down to a few bubbles gripping the sides and a few steadfast islands of rather bigger bubbles floating on top. The aroma is more coffee than I expected, so the addition of the chocolate makes it seem more like a mocha.